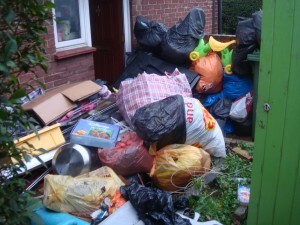 For more than 15 years, residents of Stratford have benefited from Away With Its hassle-free house clearance services. We understand how inconvenient unwanted waste and items can be and our dedicated and trustworthy team can help you to dispose of all types of non-hazardous waste – from unwanted home furnishings and clothing to electrical appliances or large furniture items. It is our customers who inform our reliable service, as it is you who inspire us to provide the perfect package to meet your needs. We listen and then respond with the most appropriate solution for your individual requirements, always aiming to surpass your expectations. After all, each situation is different and we know a one size fits all approach is far from realistic in today’s world. This effective, customer-focused business model has kept the local residents of Stratford returning year on year for support with their waste removal. Whether you are moving house, upgrading your interior or simply having a clear out, Away With It can help you to achieve your outcomes with a smooth and professional service. Fully licensed and insured, you are safe in the knowledge that choosing Away With It offers you a risk-free experience. Each house clearance project is handled exactly as you expect and as promised – with professionalism, efficiency and of course without extortionate fees! Unlike many other firms, Away With It charge for the volume of waste disposal. So if it is just one item, that’s all you pay for, meaning we can keep costs as low as possible for you. We also guarantee that the price we quote is the price you’ll pay, so you can have peace of mind without any hidden extras or unpleasant surprises. In addition, we adhere to all waste disposal regulations and recycle more than 80% of the waste we remove. We appreciate that time is often of the essence and why we are open 7 days a week, from 7am in the morning until 11.30pm at night. After discussing your requirements, our friendly team will provide a complimentary quote and if you decide to use our house clearance services, we will provide you with a two-hour time slot and call you when the team is en route. The easiest way to decide if Away With It can offer what you need is to make use of our free no-obligation quotation. This way you can make an informed decision based on your specific needs. If your needs are urgent and you require same day collection this is not a problem at all. You may also like to read some of our client reviews which will give you further insight into what to expect from our service to you. To discuss your house clearance requirements with a member of our expert team, call 0208 504 7390 or 07957 123019 or use our online enquiry form to receive a quick call back.